Wishing Well Cottage01493 720534work Self-cateringWishing Well Cottage in Caister-on-Sea near Great Yarmouth is a cosy 19th Century, 2 bedroom cottage off the main road with private parking. It is a 10 minute walk to the beach and the village centre. Great Yarmouth Racecourse is also nearby. Wishing Well Cottage has a fully equipped kitchen, comfortable lounge with TV, open fire and dining area. It has a double bedroom and a children's room with bunk beds. The cottage is centrally heated and linen is provided. There is also an outside seating area for your use. 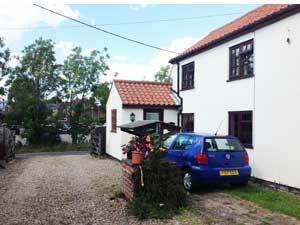 Wishing Well Cottage in Caister-on-Sea near Great Yarmouth is a cosy 19th Century, 2 bedroom cottage off the main road with private parking. It is a 10 minute walk to the beach and the village centre. Great Yarmouth Racecourse is also nearby. The region is easily accessible by road from all parts of the UK. Major trunk roads into Norfolk are the M11, A11, A12 and the A14 from London and the South-east, while the A47 and A14 serve the Midlands and the North. On approaching Great Yarmouth follow the signs for Caister on Sea. With the Kings Arms public house on your left, turn left at mini-roundabout and then left again, Bullocks Loke and Wishing Well Cottage will be the next turning on your right.